The Broke and the Bookish : Top Ten Books On Daisy's Fall 2013 TBR List! Hi guys! 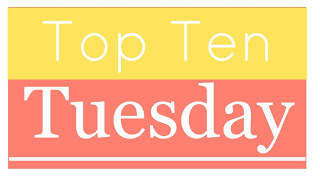 Time for another Top Ten Tuesday! This week we're talking about the books on you Fall 2013 TBR list, it can be either books you're planning to read or Fall releases you're excited about! As I'm really not very good at sticking to reading lists, I'll be showcasing the books that I'm wishing will make their way to my home in the next couple of months! Pawn by Aimee Carter: I totally loved Aimee Carter's Goddess Test series and this sounds SO EXCITING!! After Eden by Helen Douglas: I'm thinking time-travel related romance and high stakes and YES COUNT ME IN! Unbreakable by Kami Garcia: three words: ANCIENT. SECRET. SOCIETY. Seriously. That's all you need. Steelheart by Brandon Sanderson: you guys know how much I love fantasy right?? I LOVED Elantris by Brandon Sanderson and am excited that he's branching out into YA as well! Steelheart sounds EPIC! The Queens of Historical Romance Have Books Coming Out, Hold Your Bodices! No Good Duke Goes Unpunished by Sarah MacLean: SO MUCH LOVE for this author!! She never fails to get me hooked into the story and her heroines are always lovable and smart and doesn't she have the best titles??? They are so clever and I like that :) And YAY for Temple's story!! The Naturals by Jennifer Lynn Barnes: teenagers working with the FBI and profiling and just being generally awesome --> OF COURSE I WANT TO READ THIS!! Bellman and Black by Diane Setterfield: I have so much love for The Thirteenth Tale and I'm just SO EXCITED that there's a new book coming out by this author!! I hope it'll be just as wonderful as her other book was! Never Fade by Alexandra Bracken: I completely LOVED The Darkest Minds and OMG, THAT ENDING!! So you better believe I'm itching to continue Ruby's story!! So that's it for me, what's on your Fall TBR list? Any that we have in common? Books that definitely needed to be added to my list? Let me know! I forgot Pawn was coming out soon! I'm fairly excited about it! I'm the same - very bad at sticking to the reading lists I've made! Haha ;) Maybe this time we can do it! Yay! It sounds so good! Hope you end up reading and enjoying it! The Naturals sounds awesome - teenage FBI agents? LOVE IT. Come check out my TTT! I'm so exciting for Fall reading this year! These Broken Stars was fantastic! Really looking forward to Perfect Ruin and The Naturals. I started Never Fade the other day but really looking forward to diving into it for real soon! EEE! So glad you liked These Broken Stars! You'll have to let me know what you think of Never Fade! I haven't heard of most of these books - thanks for giving me some potential new books to add to my list! It's what I love so many about these lists: discovering even more books that I want to read! The Naturals sounds very interesting! I'm excited for fall reading -- it's the perfect season for curling up with a good book! I added Never Fade to my list too! I didn't add Steelheart or Those Broken Stars but they are on my TBR! Actually so is Unbreakable but I'm not as excited for it (mostly because I haven't read her work yet). I'm looking forward to Tandem and Bellman and Black as well, handn't heard of The Naturals before, glad I have now. I'm so excited for all three!! I'm really interested in Tandem! I didn't realize it was the start of a series though. Not sure how I feel about that, haha. These Broken Stars is on my list, too! I forgot about Never Fade! I need to look up several of these, like Pawn and Unbreakable! So excited about These Broken Stars!! And AAAH! Read Never Fade with me!! I am really excited for The Fiery Heart (Bloodlines #4) by Richelle Mead :) So many good books to read! Hope I can fit them all in! The Naturals! I forgot that one! So many amazing books coming up, eeeeee! You had me at ANCIENT. SECRET. SOCIETY. Unbreakable is getting added to my list! How could I forget about Bellman & Black? How? I loved The Thirteenth Tale! I can't wait to read These Broken Stars either, it sounds so good! There's a lot of great books being released this fall. Oooh, great list! I've got THESE BROKEN STARS (space!) and THE NATURALS (Criminal Minds) on mine, too! So many good books are being released soon! I need to get my hands on These Broken Stars and Perfect Ruin. Space settings aren't usually what I like to read, but I've been getting excited over it. Great picks! There has been a lot of buzz on These Broken Stars. And yes and Sarah Maclean and Julia Quinn. Love them both. I picked Sarah MacLean's new one as well. I had lots of fun reading her first two in the series. How could I forget Never Fade?! SO excited to read that!! These Broken Stars needs to get on my shelf! I am looking forward to reading These Broken Stars too and I enjoyed reading The Naturals. I am hoping it has a sequel! How did I not know about Bellman and Black?! I am a bad book scout!! Bellman and Black is on my wishlist too! I'm gonna add After Eden and Tandem onto my TBR list! I'm keen for The Naturals, Unbreakable and After Eden as well! Great list! I just downloaded the Setterfield novel from NetGalley. It looks awesome! I'm excited for Perfect Ruin too. I loved the Chemical Garden trilogy and I can't wait to dive into Lauren DeStefano's new world. What an interesting idea for a list. And what a great opportunity for all of us to share our reading. Thank you very much for this. That is a great list! Thanks for sharing. I follow a bunch of blogs who do this weekly meme, and I finally decided to throw my hat into the ring. Some of these sound so good. Love the covers on both historicals. The Naturals is going on my wish list. Omg you must read Steelheart! You must!! I'm not gonna lie - I worked on my list for weeks, and changed it about a billion times. This fall's YA and NA releases are just too freaking good! There are way too many books to narrow down to 10...but I did my best lol. Great topic ladies! This was way easier than I thought it would be! I ended up having 12 because I just couldn't narrow it down. Fun topic! Half of my TBR list is on your list!!! ♥ super excited about that! These Broken Stars was extremely good. I can't wait until it gets closer to release and I can post a review! I'm reading These Broken Stars right now and love it! I'm hoping to start The Naturals after I finish it. Great list!! :) TY for hosting. I liked The Darkest Minds too. I didn't realize Never Fade would be out so soon! I forgot about The Naturals! Yes. Yes. Yes! I also want to read Tandem. Perfect Ruin sounds really good, and I really need to get around to reading some Brandon Sanderson. Great list! Man, I really need to start doing these ahead of time and scheduling the post! That took forever for me to decide what my top ten were! I love this week's topic. It made me focus a bit on what I really want to read this fall and not just what I might get around to reading. This is my first Top Ten Tuesday. What a fun meme. I plan to continue. Great list! I initially forgot Pawn but added it. I am most eager myself for World After. My first TTT, but I've been secretly following for a while. Same issue with school as you. Thanks. Fun blog meme. Oh, I should have put The Sum of All Kisses on my list! I love Julia Quinn! AWESOME Never Fade is coming out soon! I still need to read The Darkest Minds but I somehow know I'll love it. And who is the biggest loser for not posting her link to TTT until 4pm....This girl right here. I spent my morning before class responding to others posts grr. Totally worth it though. This meme has given me the ability to branch out more. These Broken Star and Never Fade is on my list too. So. Many. Books. Grabby hands!! A list of 10 honestly was not nearly long enough for me. I had to pick & choose. A lot of yours are must reads for me that I didn't list. I'm a romance novel junkie (historical, contemporary, etc). If it's got romance I'll check it out :) Thanks for this list. My fall recommendation is the book "Come Fly With me" by author Judith Whitmore (http://www.judithwhitmore.com/books/come-fly-with-me/). The book brings together two pilots, Rick and Kate. Kate uses flying as an escape from her boring, one-sided, loveless marriage. Rick has given up completely on love after the most important women in his life have abandoned him and now enjoys the fast paced life of piloting the rich and famous all over the globe. Rick becomes Kate's flying instructor and the two soon develop strong feelings for one another. Their relationship is not made easy though and the two have to face numerous unexpected twists and turns in their lives. The book has a unique storyline and is packed full of adventure, passion and excitement. Hope you will give it a read! I had originally intended to post this on Wednesday afternoon, however, time went away with me, and I couldn't complete the post until this past evening! I look forward to making this a weekly feature, and I am thankful to finally join the lovely community of bloggers who appreciate the Top 10 Lists! I look forward to getting to know them! Mine are different except for Brandon Sanderson. Looking forward to that one a lot! Finally got round to doing this week's. Couldn't miss this one or my autumn reading would be horribly disorganised!